When British students apply to Oxford, they often list one of the Medieval or Renaissance colleges as their first choice. Because of their competitiveness, these colleges normally rank at the top of the informal league tables (the number of students graduating with firsts and high seconds). Recently, Magdalen College (pronounced “Maudlin”) came first in the rankings. 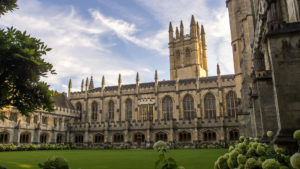 Magdalen is generally regarded as one of the three grand colleges of Oxford, the others being Christ Church and New College (both of which with OSAP also has arrangements). It was founded in 1458 by William of Waynflete, Bishop of Winchester and later Lord High Chancellor of England. The official name of the College is “The President and Scholars of the College of St. Mary Magdalen in the University of Oxford”. Magdalen has about 400 undergraduates and about 175 graduates and is one of the largest colleges in Oxford. The library is one of the largest college libraries and is open 24 hours a day; Visiting Students will have full borrowing privileges. According to the Oxford Handbook (written by students), “Magdalen’s deserved reputation for beauty is accompanied by a general atmosphere of tolerance. With the deer park and extensive grounds, Magdalen provides a tranquil and romantic background to a very high standard of academic achievement”. The college has often been described as “stunningly beautiful”, an idyllic riverside setting. Although more traditional than most colleges, Magdalen has a reputation for friendliness and a laid-back ethos. There is a room named after Oscar Wilde, a former student of Magdalen. Edward Gibbon, King Edward VIII, several Commonwealth Prime Ministers, U.S. Supreme Court Justices David Souter and Stephen Breyer, and many leaders in many fields were also alumni. The first American to teach at the University of Oxford was James Ward, BA, Harvard College. He was a clergyman and was appointed as a fellow of Magdalen College on October 10th, 1648. Magdalen has one more significant arrangement with a U.S. educational institution, it regularly welcomes a small group of students from Stanford University. The college works with only one overseas program–OSAP–to receive recommendations for Visiting Student places. The Academic Supervisor for these Visiting Students in Magdalen College is Dr. Robert Jacobs (D.Phil., Oxon. ), a lecturer in chemistry. As an experienced scholar, Dr. Jacobs will be able to persuade some of the best teachers in Oxford University to tutor these students. He will ensure that these Visiting Students are taught in the normal way by these same highly qualified tutors who teach degree candidates. For more information on Magdalen College, visit www.magd.ox.ac.uk.